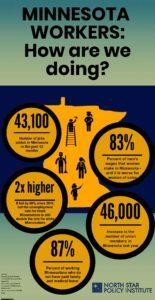 With the addition of 43,100 jobs from July 2017 to July 2018, Minnesota surpasses all of its neighboring states in terms of job growth over the last year. States with low unemployment rates—such as Minnesota—are often at a disadvantage in creating new jobs, because they have a smaller pool of available workers from which to fuel job growth. However, Minnesota has overcome this disadvantage by growing its labor force much more rapidly than the national average and twice as rapidly as neighboring states. During the current business cycle (which began with the onset of the Great Recession in December 2007), Minnesota’s rate of job growth has been double the Midwest average. Black unemployment as of July 2018 is 5.3%.1 This is down from 8.7% a year ago and down from 22.5% in 2009.2 This is good new for Minnesota workers but we still have a long way to go. The unemployment rate for white workers is 2.6%, or about half the black unemployment rate.3 Supporting investment in job training programs that connect workers to family supporting employment and continuing the progressive policies that have allowed Minnesota to grow its economy will help us close the employment gap between black and white workers.